The book resembles a photo album of the highlights of a brilliant lifetime. 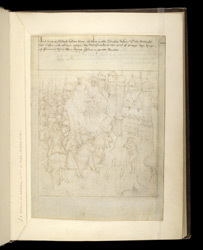 Here Richard and his cousin, the Duke of Berry, ride to Paris, on their way to the Holy Land. Like photos, the pictures try to document his chivalry and courage, with lots of details like the lamps hanging from the gate and the man carrying a heavy bag of goods through it. On the other hand, all opportunities for magnificence are played up, taking cues from contemprary sources such as illustrations of romance manuscripts.